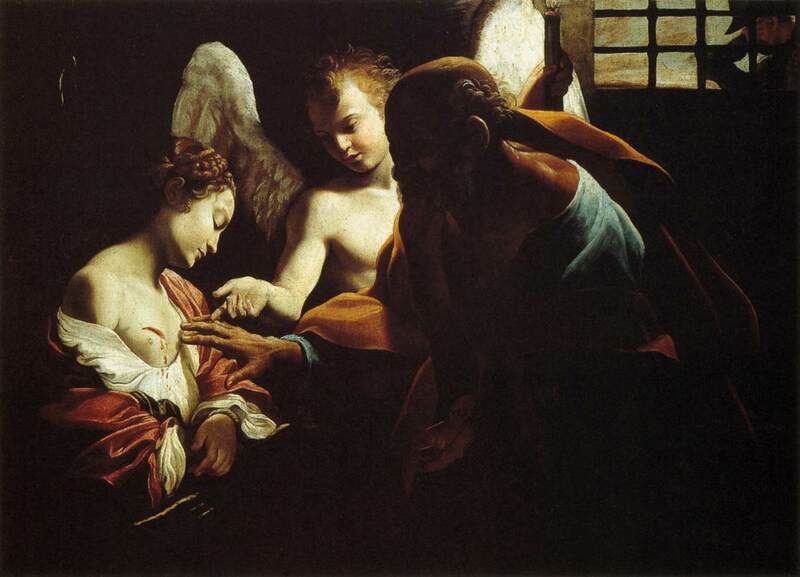 A 1614 depiction of healing, by Giovanni Lanfranco, entitled "St. Peter healing St. Agatha"
The study is one of few to examine healing from the patient perspective. “The findings are helpful because they show, from the lived experience of people who are suffering, how the winding path of healing happens,” said co-author Kurt C. Stange, M.D., Ph.D., a Distinguished University Professor at Case Western Reserve University and a Scholar of the Institute for Integrative Health, which helped fund the study. The authors performed thematic analyses of in-depth interviews with 23 patients who had a variety of medical, psychological, and social issues. All had experienced healing, defined as “recovering a sense of integrity and wholeness after experiencing illness and suffering.” Interviews were conducted by the first author, John Glenn Scott, M.D., Ph.D., for an earlier study of healing relationships between doctors and patients. Using a combination of qualitative methods to analyze the transcripts, the authors identified emerging themes and developed a model illustrating the healing journey. The process it depicts begins with a wounding event, causing suffering, defined as “the experience of distress when the intactness or integrity of the person is threatened.” Its degree and quality are related to the individual’s characteristics, relationships, and stage of life. Through persistence, the suffering person forms safe, trusting relationships with helpers, who in turn, enable the person to gain resources, such as positivity. The cycle of acquiring relationships and resources repeats indefinitely, fostering beneficial attributes, such as self-acceptance. These contribute to a restored sense of wholeness and integrity, which constitutes healing. Credit: Sara Warber, in BMJ Open September 2017. 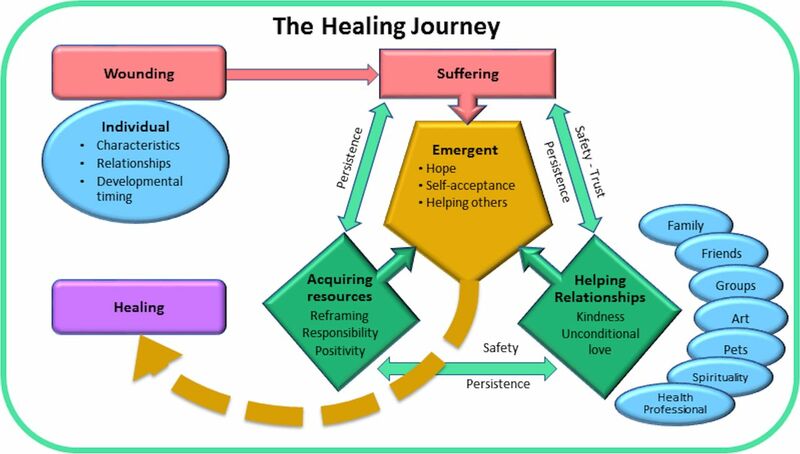 This model of the "healing journey" describes how people who are ill re-establish a sense of integrity and wholeness. Researchers' thematic analysis of patient interviews found that healing is a complex, long-term process facilitated by persistence and trusting relationships. The study found that people on healing journeys created connections with a wide range of helpers, including not only family, friends, and health professionals, but also non-human sources of support, such as pets, spirituality, and personal interests. Crucial to forming connections were a feeling of safety and a sense of trust that connections would be conducive to healing. These relationships proved instrumental in helping participants develop skills and resources through observation and practice, including the ability to reframe suffering in a positive light, the choice to adopt an optimistic attitude, and the capacity to take responsibility for one’s recovery from illness. The authors note that the healing journey was recursive in nature, not step-wise. Mustering persistence and battling despair, people continually formed connections and gained new resources. As a result, they gradually found relief from suffering and began to exhibit emergent characteristics: a sense of hope, self-acceptance, and a desire to help others—the immediate precursors to healing. Article citation: Scott JG, Warber SL, Dieppe P, Jones D, Stange KC. Healing journey: a qualitative analysis of the healing experiences of Americans suffering from trauma and illness. BMJ Open. 2017 Sep 13;7(8):e016771. doi: 10.1136/bmjopen-2017-016771.